Still straining every never to transfer contacts from LG to iPhone? Since the SIM cards vary in sizes, you cannot just insert LG SIM card on the iPhone to get contacts on it. Thought you can first upload contacts on LG phone to some accounts, like Gmail, then, sync the account with the iPhone, it takes so such time and it's not safe. Being in this quandary, you are highly suggested to use a professional phone transfer tool for helping you out. It's named dr.fone - Switch, giving you the chance to transfer LG contacts to iPhone with 1 click. It does not only transfer phone number, but copy email address, company's name, home address, and more contacts info to your iPhone. Transfer contacts from LG to iPhone in 1-Click! Easily transfer photos, videos, calendar, contacts, messages and music from LG to iPhone. Enable to transfer from HTC, Samsung, LG, Motorola and more to iPhone 8/7/SE/6s/6/5s/5c/5/4S/4/3GS that run iOS 11/10/9/8/7/6/5. Note:dr.fone - Switch supports lots of Android & iOS devices. 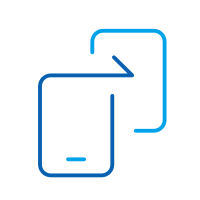 Check here to get more information about supported devices. To start with, install the phone transfer tool: dr.fone - Switch on the PC. Install it to show the primary window on the PC screen. Choose the "Switch" module. Then, connect both of your LG phone and iPhone to the Windows computer with two USB cables. 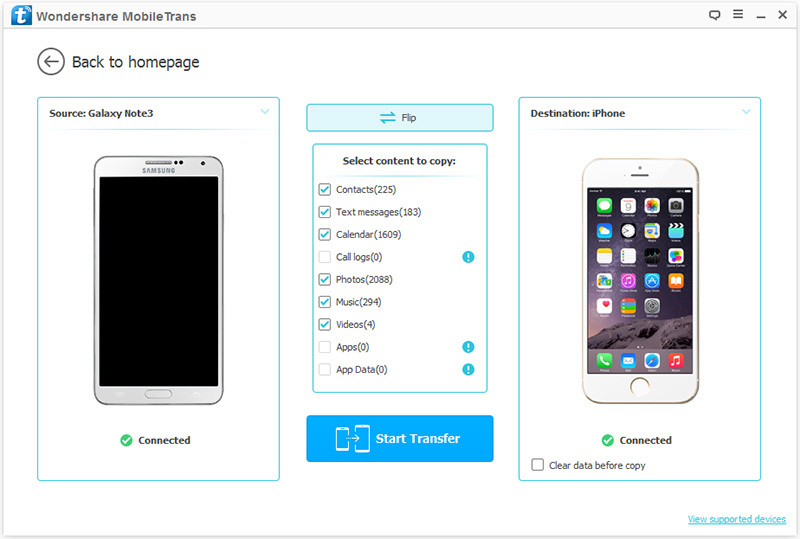 This phone transfer tool will quickly recognize the two phones. Then, your LG phone is displayed as "Source" on the left, and your iPhone, the "Destination" on the right. When clicking "Flip" between the phones, you can change their places to transfer contacts, videos, text messages, photos and music from iPhone to LG phone or tablet. Note:Tick "Clear data before copy", and the current contacts on the iPhone will be removed to save the contacts from LG phone or tablet. When you want to transfer contacts in accounts to iPhone, you need to log into the accounts on your LG phone before the contact transfer. 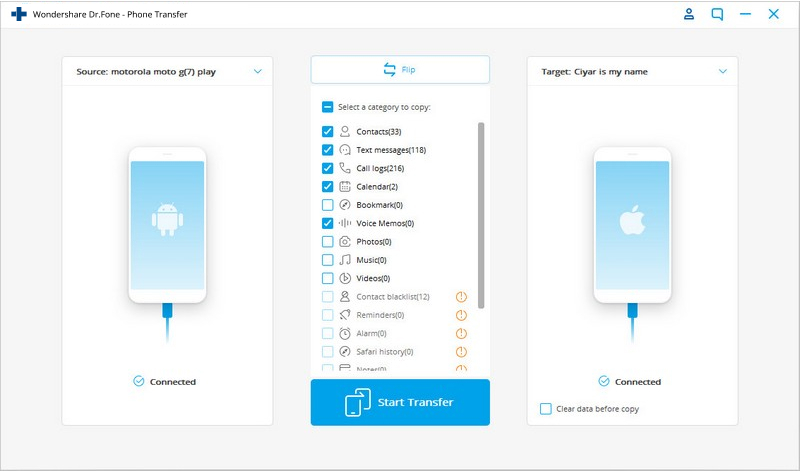 By default, this phone transfer tool empowers you to move music, videos, text messages, contacts, calendar and photos from LG phone or tablet to iPhone at a time. To move contacts, you should uncheck text messages, music and photos. 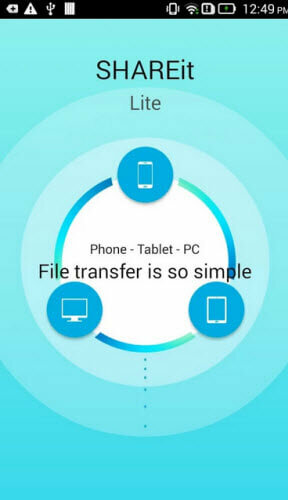 And then, by clicking "Start Transfer", this phone transfer tool begin transferring contacts from LG to iPhone. After all contacts on LG are moved to the iPhone, you just need to click "OK" to finish the contact transfer.